Shrink-wrap without scaffolding on a construction project? Can the area to be shrink-wrapped be accessed safely? Of particular note, is whether it is safe once the shrink-wrap is in position. What is the shrink-wrap going to be attached to? Sky-hooks have still not been perfected. There is a window or cladding installation delay and the openings into the building need to be closed to prevent water ingress and allow the project to continue unimpeded. A full scaffold containment is not something that would have factored in the project costings and therefore wouldn’t be financially viable. A roof integrity issue like the one above is always going to cause problems for a shrink-wrap solution, due to safe access & attachment concerns, though it can be possible in some scenarios. On new-build projects based on a steel or concrete frame, the access & attachment solutions are much easier. 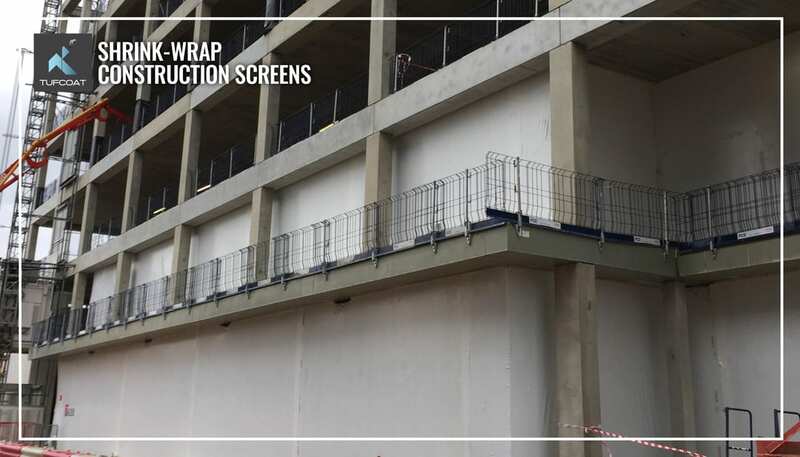 Where a project timescale is at risk from a delay in the cladding or glazing delivery, with a knock-on effect to the start of the internal fit-out, a shrink-wrap screen can prevent penalties and help achieve stage payments. This is great for making a positive impact both financially and reputationally. 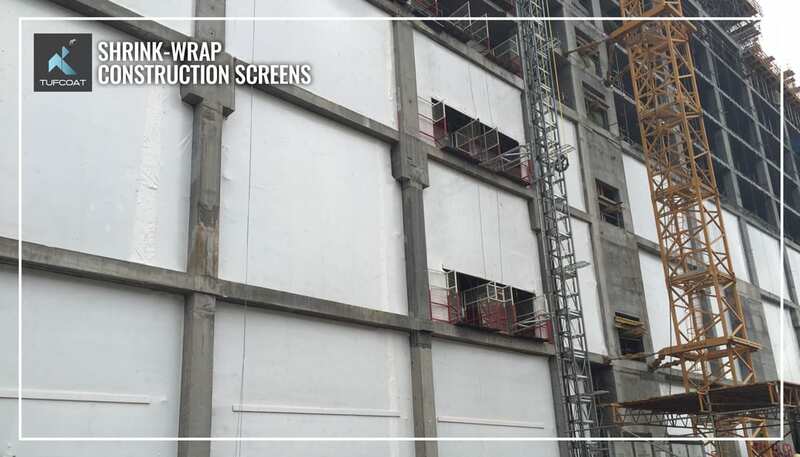 Properly calculated by a reputable engineer, and installed by experienced technicians, a shrink-wrap screen across every building opening can weatherproof the interior and allow the project to continue unabated. Once the exterior finish arrives, shrink-wrap is easily removed. 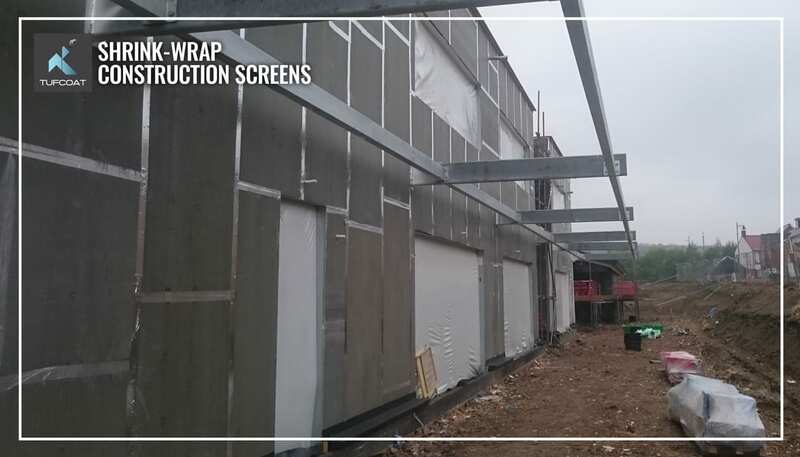 It can even be attached in such a way, as to allow the cladding & glazing to be installed prior to the screen removal, so the building integrity is always maintained. Depending on the specific structural calculations for each project, Tufcoat can create a sub-frame from webbing strap, steel cable, wood or steel tube fixed to the slab and/or beams. The shrink-wrap is then fitted onto the sub-frame and heated all over to shrink it tight to a strong, seamless finish. Screens can be up to four metres high, so we’ll often use mobile towers or elevated platforms for access. Tufcoat installers hold valid IPAF and PASMA certificates to ensure this is carried out safely and efficiently.